Home / Vacancy / Wonders Nepal Announces Vacancy for Various Positions. Wonders Nepal Announces Vacancy for Various Positions. Wonders Nepal aims to provide innovative hospitality services by designing and developing a high rise tower that offers a wide array of services including South Asia's first SKYWALK, which will be located at Kamaladi, Kathmandu. The company has a pool of experts and well equipped as well as motivated human resources to undertake this arduous task. 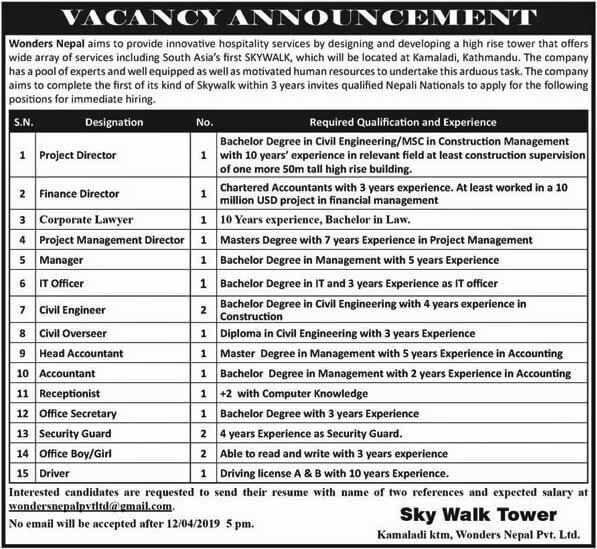 The company aims to complete the first of its kind of Skywalk within 3 years invites qualified Nepali Nationals to apply for the following positions for immediate hiring. Bachelor Degree in Civil Engineering/MSC in Construction Management with 10 years' experience in relevant field at least construction supervision of one more 50m tall high rise building. Chartered Accountants with 3 years experience. At least worked in a 10 million USD project in financial management. 10 Years experience, Bachelor in Law. 4 Years Experience as a Security Guard. Driving License A & B with 10 Years Experience. Application deadline: No email will be accepted after 12/04/2019, 5 pm.